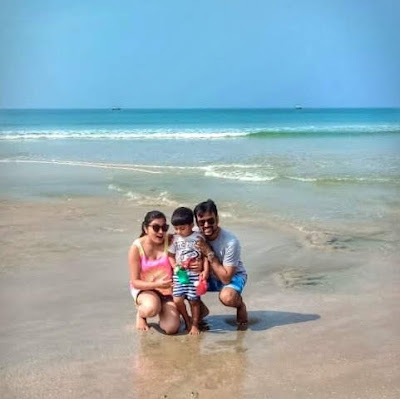 This mother’s day was made even more special when Le Meredien , Calangute , decided to host three of us mom travel bloggers in Goa. What we came away with was memories, some great mommy bonding, and the big bonus was the children got along famously aswell. We were welcomed into their plush rooms, overlooking a Mango tree laden with blush coloured Mangoes, as well as a large sized chess board. What immediately caught my attention, was the clever use of space within the room. Using a different pattern on the wall paper and the rug under the circular sofa, the helped create lounging zones in the room. The circular bed was our favourite spot, sturdy enough for jumping on, comfortable high backs to see TV from, or gaze out of the room at the unseasonal rain pattering on Mangalorean roofs. Le Meridien Goa, this one was one of the little alcoved sitting areas in the room, one of three such areas. The art in the room was inspired by the Kunbi tribe , their checked kunbi saris and the typical brass jewellery. There were 4 different places where kids can read/lounge/jump/ play/ sleep in depending on how big your kid is. For shreyu, he was immensely taken up by the cupboard, where he decided to open up a shop selling imaginary Poppins and lollipops. But he also had real chocolate lollipops as part of his welcome treat, and the cute dessert in a jar, with miniature slippers, starfish and I was blown away by the attention to detail and the painstaking craftsmanship of the F and B team . Next up was éclair decorations. Eclairs are the French inspiration that the Lemeridien draws from its origins. And more than the kids it was the mothers who enjoyed the éclair making at the signature coffee shop of le meridian, which doubles as a bar by night. We were explained that each Meridien property has a unique éclair to themselves and here it was the Mango and cashew ones. But honestly , we have been to Meridien Mahabaleshwar and Pune, but haad never experienced this part of the hospitality. (do ask about the eclairs if you ever visit a meridian property) . another unique part of the meridian properties is the art in the hotel which is unique to the place. One thing I always maintain, no destination or hotel is not child friendly, kids find everything fascinating, the question is the property ‘parent friendly’. The pros were ofcourse the circular bed/sofa, as well as ample room to run around in the room, also that there is ample cupboard space, because while travelling with a toddler, we carry their universe with them. From his toilet seat to his favourite blanket make it to the travel list. that happiness cant be faked . chess with mama. Le Meridien Goa. wonder woman and super man a DC comic special twinning for mothers day. grilled recheado chicken , at Jazz and grills, Le Meridien Goa. you know a hotel loves its moms, when they have a coffee machine in the room. Calangute is a tourist hub, convenient to visit the beach, shopping for moms , very nice salons and spas within walking distance, and every possible cuisine within a stones throw away. We loved our mom bloggers retreat to Le meridian, made more exciting by the fact that Ruchi with her daughter Ivanka and Avantika with her son Panav were part of it. Both the kids were within 10 months range of Shreysht which made the bonding between the kids heartwarming to watch. From running between chairs with Panav, to discussing the virtues of sitting in the back seat with Ivanka, the babies had as good a time as the mommies, and that’s the best gift for a mother on Mother’s day.